Frivolous? Yes, but – bags. 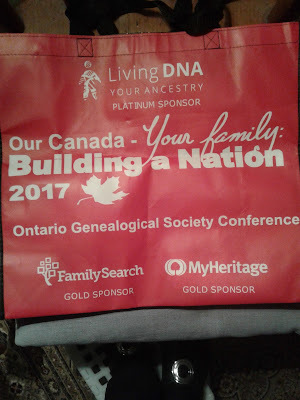 Family historians have bags. 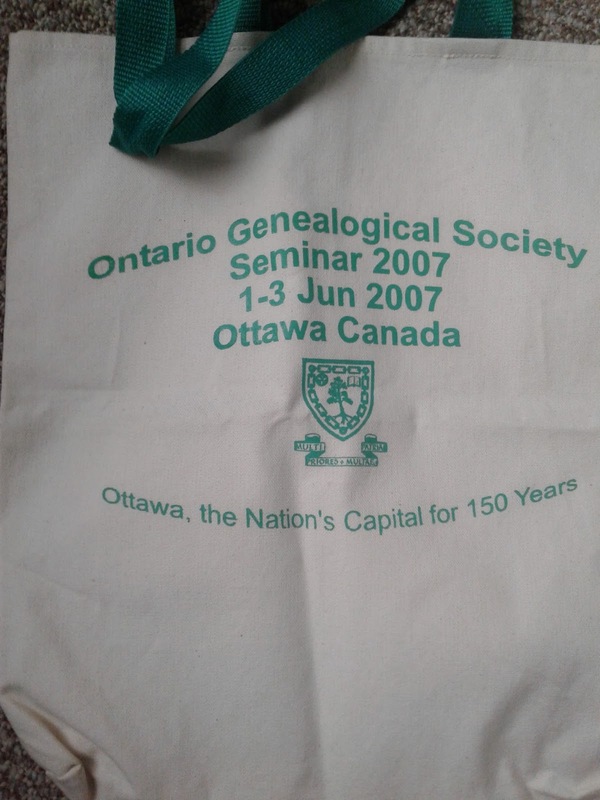 Bags are the most popular handout at genealogical conferences. Why not? We need bags to haul not only the stuff we bring with us to the conference but also the growing masses — paper, books, gadgets, snacks — we collect from daily visits to the vendors. Pens are good. Pens are also common. But they don't last as long as bags. While re-usable drinking bottles are making inroads, fabric bags are sturdy, practical, re-usable, suiting many further purposes. 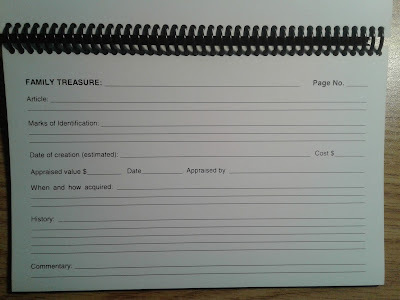 If you collect indiscriminately, you have a handy carryall for every day of the month. 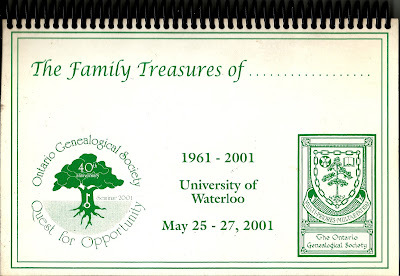 And lest it slip your mind for a moment, a constant reminder that you have more research to do. 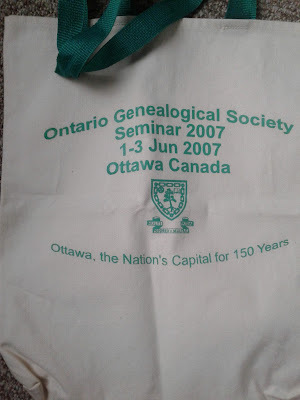 The oldest bag I've saved was from wayyyy back in the 1990s when Kawartha Branch hosted the Ontario Genealogical Society's (OGS) annual Conference. 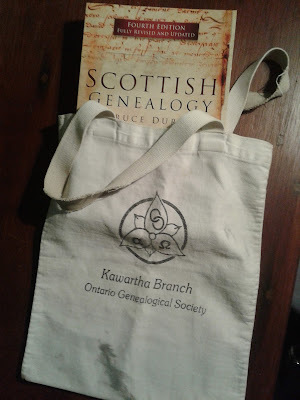 A small bag, perfect for library books. A little worn and ink-stained now. However, it would not be quite accurate to say that you can never have enough bags. Sometimes you can. Sometimes when you open the cupboard door they fall out in a messy heap. They multiply like crazy, taking up more space than the groceries you tote home in them. Attention, OGS and other conference organizers! How brilliant is that?! This is a great answer for aging (who isn't?) 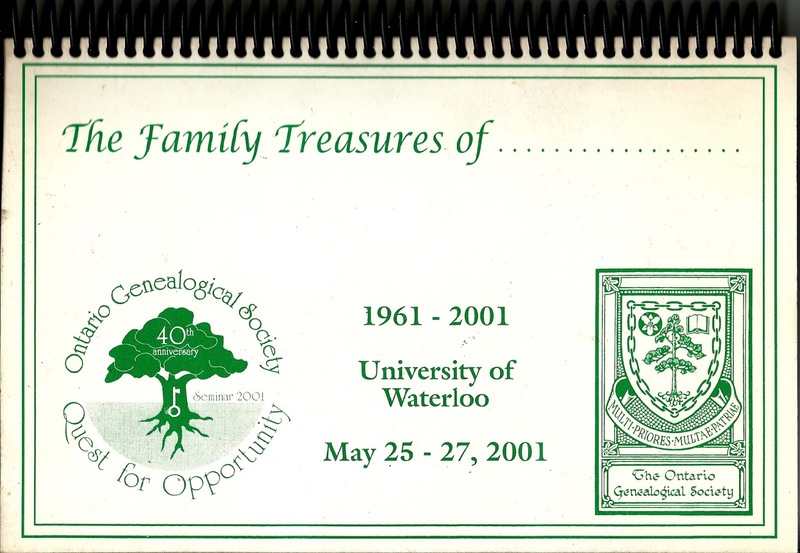 family historians who want to capture provenance of family heirlooms, gifts received, sentimental souvenirs, and/or personal jewellery and art work — especially when we have devised certain items to certain heirs. Continuity. Now I don't know what the cost of such an item would be, ordering in the hundreds. But doesn't it grab your fancy, just a little?